Create your art… make it custom… make it YOURS… eMail it to us and we may use it on our pages! 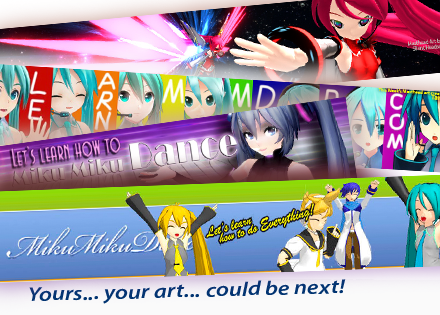 Make LearnMMD Masthead Art and eMail it to us! … we may use it on our Pages! Readers can contribute their art for use on our pages! Download the Masthead Template zip. It includes an instructions image and a short written ReadMe.txt file that explains how it all works. Create your art using whatever art/paint program you wish. Download the Masthead Template zip folder… and get started! well, the masthead is done, how do I send it to Reggie I meant where? Google+/Gmail/here??? I dunno…. His address is right there, highlighted in the article. Lookin’ forward to see what you made!